Why You Shouldn’t Blame Your TV For Poor Sound. Anyone shopping electronics this holiday season is sure to notice the advancement in TV technology. There are so many choices. Do you get the new quantum dot 4K display technology? or a curved TV? or an old-fashioned LED? Judging by current speaker size and placement, it appears blatantly obvious that most manufacturers care little about sound quality. Should we get mad at them? Nope. The reason being, they have never advertised anything more than a gigantic screen and astounding resolution. Many modern TVs don’t even have enough room to put forward facing speakers anymore. I don’t think that the general public is really helping solve this crisis. Not deliberately, but because I think that it is more of an unknown. Many people feel that when they purchase a TV they are getting a similar value in sound. I am ashamed to admit, but I recently was one of “those people.” I think it is natural to assume that sound and picture go hand in hand. This couldn’t be farther from the truth. CNET recently took a poll and found that 33% of their readers watch Television on their TV speakers. The positive takeaway is that 67% of those out there realize they need/want more. However, that leaves 33% still up in the air for one reason or another. Why are there still many who use the standard TV speaker? I think it could be a number of reasons. Viewers could be content with the sound. They are casual watchers and don’t find anything wrong with it. I think there is also a large number that may not know any better. What about cost? Of course this could be another issue. What do you think? This is where I would like to address the 33% and make a case for investing in a home audio system for your TV. Let me begin with a question. Do you still watch and listen to television on your TV speakers? Do you ever remember saying, “What did he just say?” while rewinding and scooting closer to the TV? Yup, that was me, and if you can relate then you may want to get some real speakers. At its core, sound is made up of frequencies. Sound happens across a variety of these frequencies at a certain loudness measured in decibels. Some frequencies we can hear and others we cannot. Think about the legendary dog whistle example. Why on earth can’t you hear a dog whistle when blown? Well, it’s all about frequency. Another example. Ever wonder why nails on a chalkboard make most humans cringe with annoyance? Again, that specific sound falls within a particular frequency that most humans find unbearable. Check out the graph. You will notice that human conversation happens to fall within another particular frequency. The quality of a speaker is it’s ability to recreate all of the frequencies across decibel levels. You can learn more about this by studying how frequency response is measured and how you can interpret the graph of a particular speaker. If you want to learn more about the science of sound we have a couple great resources. The first explains the physics of sound and the second will explain how speakers work. The cold hard truth that I have come to believe is TV speakers were not designed for enjoying but listening, and sometimes the speakers make it hard to even do that. TV speakers are horrible at producing the full range of frequencies accurately causing “blind spots” your ears can not pick up. Hence the “What did he say?.. Rewind it!” And raising the volume many times will only make the problem worse. Here’s the deal. When I first began to understand this concept it was like I had taken the blue pill in The Matrix. You could sum up my experience in a simple 4 step process that I hope others can come to experience. Step 1. Enlightenment – Come to the realization TV speakers are not meant to be enjoyed. Step 2. 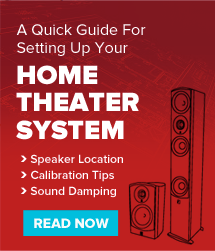 Study – Learn about what makes great sound. Step 3. Selection – Buy great speakers (we naturally think ours are the best but we recommend you compare so you know for yourself). Step 4. Share – Talk to your friends and family about your experience. For example, next time you are at a friend’s house, act like you can’t hear the dialogue. Then ask if he only has regular boring TV speakers while giggling under your breath. Then show him the light. In closing, I hope to leave you with a few analogies. A new TV without good speakers is like working out at the gym in jeans and a sweater, like watching a 3-D movie without the glasses or eating spaghetti with your hands. Yes, you can do it, but there’s a better way.